Calling all barbecue lovers! 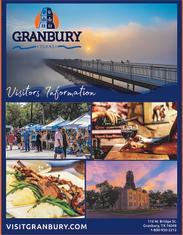 Head to Granbury for General Granbury&apos;s 41st Birthday Bash March 16-17, 2019. Put your taste buds up to the challenge of choosing the best ribs, brisket or beans! Think you&apos;ve got what it takes to win? Share your own barbecue cookin&apos; in the annual Bean & BBQ Cook-off! With craft food and shopping vendors, fun activities, live music, and free cake and ice cream, it&apos;s a great event for the entire family. Don&apos;t miss some of the big Texas artists hitting the stage on the Historic Granbury Square, and of course, the hilarious outhouse race. This birthday bash is one-of-a-kind! To find out more information, contact the Historic Granbury Merchant&apos;s Association.